Sound With SACDs, "the SA-60 rendered the myriad instrumental timbres in a neutral fashion -- neither too warm nor too cool. I heard both wood and reed from woodwinds, both body and string from strings." With CDs and using PCM => DSD conversion,"I always found the sound to be most organic. Music had the flow that I typically associate with good vinyl. Notes kept their precise places in time but were slightly more rounded than with either of the PCM modes."
. The Cirrus Logic 4398 digital-to-analog converters handle both PCM and DSD in their native forms, as well as offer user-selectable up-conversion of PCM data, either to a higher bit-depth and sample-rate data or to DSD." "The SA-60's circuit is fully balanced, and the balanced outputs are driven independently from all of the single-ended outputs." Use With CDs, it was important to use the FIR or especially the PCM => DSD settings to avoid a "mechanical" character and flattened soundstage. "Clearly the digital-to-analog conversion and output circuits of the SA-60 have been optimized for DSD, so, even when reading from a PCM source, the best results are obtained from that form of data." Value "The advantages of trickle-down technology from one of the largest makers in the industry mean that high-class performance is available for what is, in high-end-audio terms, a reasonable price." In the mainstream technology press and, to a certain extent, in the various audiophile publications, we read of the abandonment of physical media in favor of music downloads. Our own Doug Schneider, after his experiences with the Slim Devices Transporter, has declared the CD transport to be dead. So what am I doing reviewing a product that still spins little silver discs? Aside from being an excellent CD player, the Esoteric SA-60 plays back SACDs, DVD-As and the audio tracks of DVD-Vs. Furthermore, it can decode the multichannel sections of all of those formats. The SA-60 ($4600 USD) is the audio-only version of Esoteric's acclaimed DV-60 ($5600) -- the successor to the equally acclaimed DV-50. Many audiophiles have purchased the DV-50 and DV-60 strictly for their musical abilities, without any intention of watching movies on them. Essentially, what the engineers at Esoteric have done with the SA-60 is to omit the video section, leaving the audio section intact. Now you are not forced to pay for functionality that you do not intend to use. Cosmetically, the SA-60 is virtually identical to the DV-60. Measuring 17 3/8"W x 5 7/8"H x 13 7/8"D and weighing just over 30 pounds, the SA-60 is a serious piece of audio equipment. The tall faceplate, with its squared corners, exudes strength and substantiality. Whereas the design of some audio equipment brings to mind a sports car, the SA-60 clearly says Hummer. Inside, the SA-60 is no less impressive. It employs the same proprietary transport and clamping mechanism of the DV-60, which is similar to, but vastly scaled-down from, Esoteric's higher-end VRDS NEO mechanism. The Cirrus Logic 4398 digital-to-analog converters handle both PCM and DSD in their native forms, as well as offer user-selectable up-conversion of PCM data, either to higher bit-depth and sample-rate PCM or to DSD. Around back you'll find high-quality RCA jacks for the multichannel outputs, as well as both RCA and XLR jacks for the front left- and right-channel outputs. The SA-60's circuit is fully balanced, and the balanced outputs are driven independently from all of the single-ended outputs. On the back panel you will also find optical and coaxial digital outputs, the obligatory IEC power receptacle, and the not-so-common facility to connect the SA-60 to an external word clock. There are many reasons why I have restricted my audio system to two channels, not least of which is all of the time required to set up a component for multichannel reproduction. The SA-60 has options for selecting speaker size, time delays, and whether a subwoofer will be used, but, fortunately, all of those settings apply only to the multichannel outputs. If you intend to use the SA-60 in a multichannel system, rest assured that it has the adjustability you'll need, but for those of us who wish only to use it in two-channel mode, the thoughtful designers at Esoteric have made the SA-60 plug-and-play friendly. 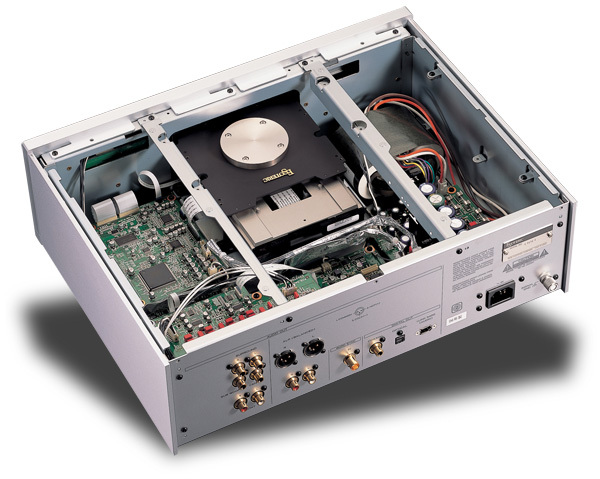 The SA-60 took up residence in a system consisting of a Graaf GM-50 integrated amplifier and Amphion Argon 2 minimonitors. For comparison, I used an Ayre C-5xe universal audio player, which is natural competition for the SA-60. Cabling was DH Labs Revelation from source to amplifier and Q-10 from amplifier to speakers. All equipment was plugged into an Equitech Son of Q balanced power isolation transformer. I did experiment with a single-ended connection between source and amplifier, but I did most of my listening balanced. The differences I heard between the two with the SA-60 were slight and could not be attributed to the unit itself rather than cabling or the different circuit paths of the Graaf integrated amp for balanced and unbalanced input. I had one in-use issue with the SA-60. In quiet passages and between tracks, I found that whirring from its transport was audible, and mildly distracting, from my listening position eight feet away. If your equipment rack is farther away from your listening chair than mine, or if you are not blessed with a noise floor in the low-40dB range, then you are not likely to notice the whirring. I do admit to being exceptionally bothered by such things -- to the extent that, in the middle of a fierce Midwestern winter, I turn off my furnace when listening to music. This transport noise is my only design gripe for what is otherwise an extremely well-executed product. DVD-Audio might be dead, but SACD is alive and well, particularly in Europe and Japan. Now that Osmo Vanska is directing the Minnesota Orchestra, BIS has taken over the recording responsibilities from Reference Recordings. Either way, this orchestra must be one of the best recorded in the world from an audiophile perspective. Their ongoing releases of Beethoven symphonies range from good to very good. Playing these SACDs through the SA-60, the orchestral landscape was spread out before me, stretching beyond my speakers, from side to side and to the very back of the stage. Not only was the soundstage vast, but it was remarkably stable regardless of volume. In the transition from the third movement to the finale of the Fifth Symphony [BIS SACD-1416], the brass crescendoed to a believable fortissimo without moving from the back of the orchestra. Most components can handle relatively precise imaging in sparsely orchestrated passages, but even with the entire orchestra in full swing, the SA-60 made it possible to differentiate the spatial positions of the various instruments. The SA-60 also conveyed the distinct sound of the recording venue of each disc. Given the right recording, the SA-60 could make the soundstage sound positively cavernous. Reverberations from the very back and the side walls died away as precisely as I hear them when I attend a concert. The only thing lacking from the experience of being there was the inevitable person coughing two seats over. Listening to well-recorded orchestral works also gives me the opportunity to assess the tonal accuracy of a component. The SA-60 rendered the myriad instrumental timbres in a neutral fashion -- neither too warm nor too cool. I heard both wood and reed from woodwinds, both body and string from strings. When I listened to the Berlin Philharmonic (Beethoven's Fifth with von Karajan conducting [Deutsche Grammophon 429036]), I heard brass instruments that had a burnished quality, whilst their American colleagues gave a little more sizzle to their sound. The SA-60 didn't highlight this or that frequency range, but presented the tonal colorscape as the composer and musicians intended it to be heard. The SA-60 managed to maintain its tonal balance even in the loudest passages. In densely orchestrated passages, it blended all of the instrumental timbres without confusing them. If I wished to follow a particular instrument, I could do that, but it was equally easy to listen to the orchestra as a whole. The SA-60 displays real prowess with large-scale works, but it was equally adept at handling string quartets such as those on the Tokyo String Quartet's Beethoven Quartets Op. 59 [Harmonia Mundi 807423.24]. While a full orchestra challenges a component with a wide tonal palette, a string quartet requires that the same component present each nuance of a particular instrument's character, and the inflections with which it is played. I know if these fine details are being preserved when I can listen straight through an entire piece, not skipping from movement to movement. I listened to the entire SACD straight through on the SA-60, never getting bored. After my very positive experience with SACDs, I must admit to having been a little disappointed the first time that I played a standard Red Book CD in the SA-60. The sound was a bit mechanical, and the soundstage much flattened. I don't mean to say that it sounded awful, just more like what I'd hear from a good $2000 player, not one that costs $4600. So I let the SA-60 burn-in for another week, but I returned to unchanged sound. It was at this point that I started experimenting with the user-selectable digital filters. In the past, I've found such algorithms to be subtle or imperceptible, but with the SA-60 the FIR+RDOT and PCM => DSD were distinct, and I have no doubt that I could identify them in a double-blind listening test (for those of you who believe in such things). A perfect example of the differences were on "(Call It) Stormy Monday" from Eva Cassidy's Live at Blues Alley [Blix Street 10046]. With the FIR+RDOT setting to which the SA-60 defaulted when I first turned it on, the soundstage was almost flat, and the cymbals sounded as though they were being produced by a synthesizer. Changing over to FIR expanded the soundstage in both width and depth, and made the cymbals sound like they might actually be made of metal, not bits and bytes. Switching again, to DSD conversion, added yet more shimmer to the cymbals and moved them a few feet back in the stage. If you are skeptical of such mathematical acrobatics as up-conversion, as I was, you need only to listen to these settings with the SA-60 to become a believer. A single circuit cannot perform equally well with all types of inputs. Clearly the digital-to-analog conversion and output circuits of the SA-60 have been optimized for DSD, so, even when reading from a PCM source, the best results are obtained from that form of data. Throughout my subsequent CD listening I experimented with the different filter schemes, almost always returning to the PCM => DSD option. With this setting, I always found the sound to be most organic. Music had the flow that I typically associate with good vinyl. Notes kept their precise places in time but were slightly more rounded than with either of the PCM modes. On occasion, I found the more visceral impact of the FIR filter to be a better complement to a particular selection. I would expect most listeners to leave the SA-60 on PCM => DSD -- a setting that the SA-60 remembers, even when the power is cycled -- but it is nice to have the option to change the character of the player so dramatically. I did not come across any recording for which I felt that the FIR+RDOT signal was preferable to either the FIR or PCM => DSD options. If you go to hear this component at a dealer's showroom, be sure to listen to all three of the settings; otherwise you may well miss out on one of the greatest strengths of this player -- the ability to impart to music on CD a sense of ease rarely heard at this price point. At $5950, the Ayre C-5xe is about a third more expensive than the SA-60, but it might well be considered in the same price class. There are a few differences in design between these two players that could make one more appealing than the other. Though they are both universal audio players, the C-5xe is only capable of playing back two channels of audio (when a multichannel region is selected the signal is down-mixed to stereo). If you are one of those extremely rare audiophiles with a music-only multichannel system, the SA-60 is the player for you. Both units are built to extremely high standards outside and inside. The Esoteric-designed transport slides in and out silkily, while the Ayre's Pioneer-sourced transport seems a little clunky. Once the discs are spinning, however, the Ayre is nearly silent, while the Esoteric emits the whirring noise I mentioned earlier. Both players are fully balanced, but whether this distinction matters to you will depend greatly upon the circuit topology of your preamp and perhaps your dedication to a particular design philosophy. For me, I care more about the result than the means of achieving it. On sonic grounds, the differences between the two players are subtle. The C-5xe seems to have a slightly lower noise floor and a somewhat more forward presentation, making evident a level of detail beyond that heard from the SA-60. While the Esoteric player is adept at retrieving detail from recordings, the Ayre goes a little further. When I listen to the C-5xe, I am continuously amazed by the quantity of data on every disc. With the SA-60, I didn't feel that I was missing out on things, but I just wasn't in awe of its resolving power. Both players have exceptional drive and impact. Bass notes with the C-5xe are a little more taut, and with the Esoteric a little more full. The mid-treble region (flutes and soprano voice) with the C-5xe is a little more tangible, while the Esoteric causes such notes to sound as though they are floating ethereally in the space between my speakers. Such differences are only apparent in an A-B comparison, and are, in any case, distinctions of preference rather than quality. Despite all of its many layers of detail, I do not find the Ayre to be fatiguing, but I found the slightly rounded presentation of the SA-60 delightful. I thoroughly enjoyed my time with the Esoteric SA-60. It shines in terms of the ease with which it reproduces music. Many lower-cost digital players claim to have an analog-like sound, but they achieve their smoothness at the expense of detail. Not so with the Esoteric SA-60. When using its PCM-to-DSD conversion, the SA-60 is more reminiscent of a quality analog front-end, reproducing both smoothness and detail, than any other digital player I've heard. I see the SA-60 as being an attractive component for both the digital-only audiophile who wants to enjoy a higher resolution than CDs can provide and the vinyl lover who would like to listen to modern recordings but has been unable to find a compelling digital source. The advantages of trickle-down technology from one of the largest makers in the industry mean that high-class performance is available for what is, in high-end-audio terms, a reasonable price. Even if you forget this, the SA-60 plays music as though it knows what music is about. What more can you ask of a component? Until the time when there is a media-less solution that offers all of the SA-60's functionality and sound quality, I say "Let the silver discs spin!" We greatly appreciate the SA-60 product review and evaluation by the SoundStage! Network. We feel that this review is fair, informative and objective. One point of clarification is that any motor noise or "whirring sound" generated by any our products is considered a defect under our three-year warranty. Upon notification of such an occurrence, Esoteric replaces the unit. Unfortunately, Esoteric was not notified of this occurrence until publication of the review. Since our field-failure rate is exceptionally low, we feel it unfortunate that we were not allowed the opportunity to replace the sample. We thank the editors for the opportunity to comment, and we are grateful to be associated with the SoundStage! Network.